Find that bunny! Is he canoeing down the Amazon, biking across Paris or having tea with the Queen? Track him down! Hurray – it’s Easter. But if you want chocolate eggs, you’re in trouble. Foxy has run off with the Easter Bunny’s recipes – and that means no chocolate at all! Now the Easter Bunny is on a madcap chase to get his precious secret recipes back. Will the Easter Bunny catch up with Foxy? Or will that naughty thief spoil everything? Find out in this global search-and-find caper, with over 500 yummy things to spot! 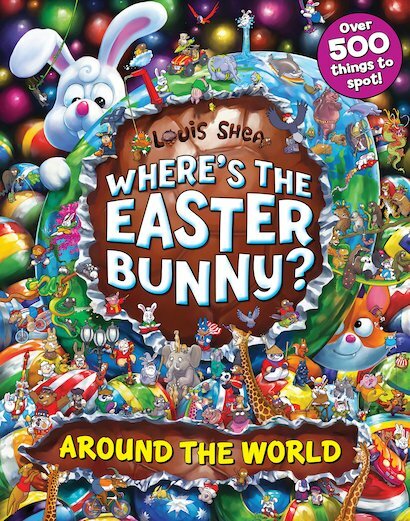 From the bestselling creator of Where’s Santa? A perfect little gift for Easter baskets/egg hunts!